In 2015, the Louisiana Legislature passed the Alison Neustrom Act, which paved the way for the production, recommendation, and use of therapeutic cannabis. The LSU AgCenter is operating its Therapeutic Cannabis Program under one of the two licenses in Louisiana. The LSU AgCenter selected GB Sciences Louisiana, LLC., as partner to cultivate and produce therapeutic cannabis products for patients with specific conditions. GB Sciences is a cannabis company focused on biopharmaceutical development, and has filed patent applications for use of cannabis therapies with neurodegenerative disease, chronic pain and heart therapies, as well as arthritis, Crohn’s disease, inflammatory bowel disease and asthma. In compliance with the Act, approved medical care providers will oversee patients with debilitating conditions. Patients who have exhausted other medical options without a positive result may be recommended therapeutic cannabis by their practitioner, through specific delivery methods and specified dosages. The Louisiana State Board of Medical Examiners has developed stringent guidelines for doctors to recommend therapeutic cannabis, including regular follow-ups and reporting. The LSU AgCenter continues to work closely with state regulators, including the Louisiana Department of Agriculture and Forestry, the Louisiana Board of Pharmacy and the Louisiana State Board of Medical Examiners to ensure that patient and public safety are at the forefront. GB Sciences Louisiana began renovation of their production facility in April 2018 and anticipate product availability for patients in 2019. The production facility will not be located on LSU’s campus and no one under 21 years old will be employed in the facility. 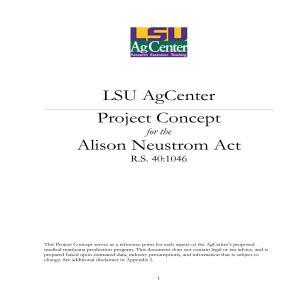 Under the terms of the agreement, the LSU AgCenter will receive $3.4 million or 10 percent of gross revenue, whichever is greater, over five years. GB Sciences Louisiana will support LSU AgCenter research through funding for personnel, laboratory research space and equipment and an additional monetary contribution for research initiatives. As a public institution of higher education, the LSU AgCenter’s partnership with GB Sciences Louisiana represents a first in the therapeutic cannabis industry. No taxpayer dollars will be spent on the project. As the licensee, the LSU AgCenter is authorized to conduct research on therapeutic cannabis.The potential for research in both genetics and planting breeding, in addition to extraction, formulation and compounding processes are important elements in the initiative. The LSU AgCenter intends to apply their vast scientific knowledge and experience with existing technologies currently utilized on other agricultural commodities to the cannabis plant. Research will likely include tissue culture propagation, variety development, growth management practices, extraction techniques, compound identification and isolation, drug delivery methods, and efficacy testing. In addition, the LSU AgCenter has had preliminary discussions with Pennington Biomedical Research Center and the Health Science Centers in New Orleans and Shreveport on opportunities for research collaboration. Basic clinical research will be needed to formulate and compound the medicine to target certain disease states as outlined in the law. Click here to learn more about the LSU AgCenter’s research on therapeutic cannabis. The LSU AgCenter and GB Sciences Louisiana anticipate production facility construction and renovations to be completed by the end of 2018 and anticipate product availability in 2019. All products must be available through pharmacies licensed by the Louisiana Board of Pharmacy. Patients with qualifying medical conditions should discuss medical opportunities with their physicians. The Louisiana State Board of Medical Examiners has developed rules relative to the recommendation of therapeutic cannabis by licensed physicians. Regulations include mandatory testing and qualifying by physicians and regular reporting of patient status. Additional information on the Board of Medical Examiners can be found at www.lsbme.la.gov . 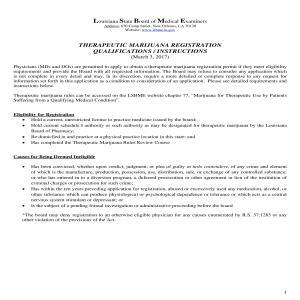 The Louisiana State Board of Medical Examiners requires physicians complete an online registration course. CLICK HERE for the online Board Orientation and Courses. Louisiana law limits the number of pharmacies to dispense therapeutic cannabis to ten licenses. These pharmacies have been selected by the Louisiana Board of Pharmacy through an application process. Additional information can be found at www.pharmacy.la.gov . The Louisiana Department of Agriculture and Forestry is named as the regulatory agency for the licensees. Information on the regulations can be found at www.ldaf.state.la.us, or click here for the current rules. (06/15/17) BATON ROUGE, La. — The LSU AgCenter has notified the Board of Supervisors of their intent to contract with GB Sciences, Inc., to produce a medical marijuana product for qualifying patients. 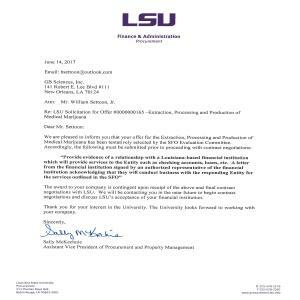 GB Sciences will work under the LSU AgCenter license in compliance with state law and rules established by regulatory agencies. While Louisiana has had legislation since the late 1970s regarding medical marijuana, the lack of enabling rules and regulations prevented patient access until the passage of Senate Bill 143 in 2015. Sen. Fred Mills, of Breaux Bridge, authored the legislation, paving the way for the production, recommendation and use of medical marijuana. The act (La R.S. 40:1046) became known as the Alison Neustrom Act, in honor of Dr. Alison Neustrom, of Lafayette, who was an advocate for medical marijuana. At 42, Dr. Neustrom passed away from aggressive pancreatic cancer. (06/24/16) BATON ROUGE, La. 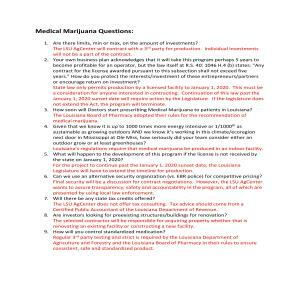 – The LSU Board of Supervisors on Friday (June 24) approved a resolution allowing the LSU AgCenter to begin taking steps needed to obtain a license to produce medical marijuana as part of a state initiative. §1046. Prescription of marijuana for therapeutic use; rules and regulations; Louisiana Board of Pharmacy and the adoption of rules and regulations relating to the dispensing of prescribed marijuana for therapeutic use; the Department of Agriculture and Forestry and the licensure of a production facility.